The digital world has its own space for Cryptocurrencies. Everyone knows Bitcoin is the most favored cryptocurrency due to its market capitalization and historical value. Miners are always trying their level best to mine bitcoins. When we think about the money, we always think about how safely we can save money? As you protect your money with traditional net banking, It also goes with digital money. Digital currency bitcoins are stored in the distributed blocks using blockchain technology. Though it is safe and secured, many hackers or intruders are trying their best to hack them. You need to ensure that the bitcoins are into a safe wallet. This safe wallet is nothing but a crypto wallet. Now will see some tips to secure your bitcoin wallet. They are as follows. Don’t overload the wallet with Bitcoins. Keep only a few bitcoins which can be regularly used. You can load the wallet once it is used completely. It is almost like our physical wallet, we don’t make it overflow. Maintain your crypto wallet in the same way you maintain your physical wallet. This crypto wallet will be saved in your mobile. Don’t keep all your bitcoins in the crypto wallet, by chance if you lose your wallet, you will lose all your bitcoins. Backup is always the best option to save any particular data. Similarly, you take the backup of your crypto wallet to save your Bitcoins. It helps you in case if there is any computer crash or failure and if it is encrypted you can recover the wallet. Take the whole backup Your wallet will contain private keys. you can take backup of those private keys in order to recover your wallet. These are the keys of bitcoin address. Prefer multi locations Saving the backup in one single place is prone to theft. Saving the backup of your wallet in multi-locations are preferred. Always encrypt your wallet while sending from and receiving data to the wallet. So it is not easily accessed by an unauthorized person. Don’t forget your password: Don’t forget your password or else you will lose all your bitcoins. Either make a note of your password or save it in a secured place so that it is only accessible to you. Use some powerful password Make your password in such a way that it contains at least 16 characters with alphanumeric and special symbols. You can use some software programs to create your powerful password but don’t forget the password. Keep a note of it or try saving in some secure place. Create it in such a way that it is not easily guessed by your near ones at the same try to memorize it. Always keep your wallet offline. Keeping wallets offline is known as cold storage. If it is offline, it is not more susceptible to theft or hacking. Keeping anything online is prone to hacking or any threat. Always keep it in a secured place which is not easily accessed by any unauthorized person. Many digital wallets provide cold storage so check whether your crypto wallet offers such facility to keep your wallet offline. Try updating your bitcoin software. It enhances security and safety. In case if it is not updated it is more prone to security threat or theft and it might be easily hacked by the hackers and you may lose all your bitcoins. Always stay updated with your bitcoin software. Digital signatures are used to verify the transactions to maintain the safety and security of the transaction data. Now multi-signature links to more than one key and these keys are used to verify the transaction. The main responsibility for the transaction is assigned to more than one person i.e the authorization or approval for the transaction is taken from more than one person. It ensures the security of your crypto wallet with more than two levels of authorization or approvals. Testament is a will, prepared for your money or property. As per law, any land property or money you earned will be given to the intestate heirs if it is not mentioned in your testament. Unlike the testament, here the crypto wallet will be completely lost if you are no more in future so you need to tell your password to a family member or any trusted person. In the future, it may be helpful for the near ones to recover the data. Either let them know the password or know the location where the password is saved. Hope this article helps you to secure your bitcoin wallet. 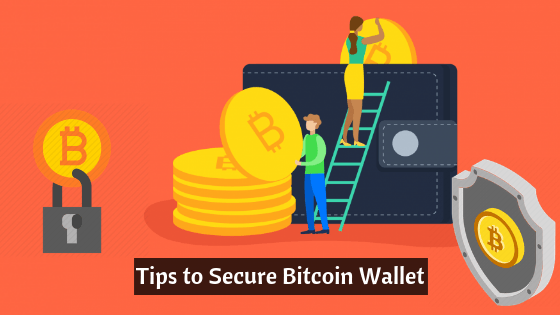 As you safeguard your earned money or property with safety features it is also important to safeguard your crypto wallet or bitcoin wallet with safety and security features For sure these tips will assist you how to backup your wallet, create and store a strong password safely, about the features of bitcoin software like multi signatures and encrypting your wallet to ensure security and safety of your bitcoin wallets. Bitcoin Wallet is suggested by the experts of the Blockchain development industry, Build Your Own Bitcoin Wallet App with the leaders in Blockchain Development.